We have a Crisis of Trust in America and it has become so pervasive that it is paralyzing America's natural inclination towards risk taking and innovation. This Crisis in Trust is a direct result of Monetary Malpractice and the Moral Malady which it has inflicted on America. Some would argue that the lack of growth and jobs has created a sense of uncertainty in America which has manifested into historically low levels of confidence and sentiment. I would argue the cause is a crumbling foundation of trust and the cause and effect the opposite. 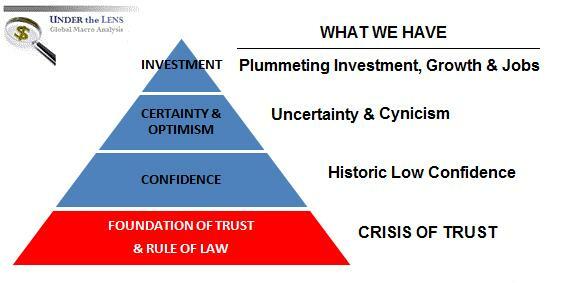 It is a Crisis of Trust which is the foundation for confidence and sentiment levels in a nation. Trust fosters certainty and a sense of security. Uncertainty is the death knell for business investment and finance. Today's plummeting capital investment in America means slower growth and an even tougher job market lay ahead. So where does a Crisis of Trust stem from and why do we suddenly have one? The dot.com bubble and its subsequent implosion in 2000 unnerved our society with a sense that something wasn't right. People couldn't quite put their finger on it, but there was simply too much money everywhere for any "half baked" dotcom idea, and the daily IPO lotteries showed that greed was running wild. The Fed Chairman "Maestro" Alan Greenspan did nothing during the era of "Irrational Exhuberance". It was extremely unsettling to the general public but when it imploded and executives from Enron, Worldcom, Tyco and others were publically paraded off to prison, some level of trust was restored. However, perceptions and confidence were weakened. Similar to previous financial debacles, like the S&L crisis of the 90's, highly visible penalties were metered out. It was obvious to all during the trials that the Fed had allowed much of this explosion to occur by not curtailing the unpoliced and out of control securitization industry, through tighter banking restrictions and not impeding the CFTC. The era of reflation immediately followed the dotcom implosion and it was also brought to us by the Federal Reserve, with its even easier money, for even a more sustained period of time. The result was a housing bubble and implosion of historic proportions. What was the Fed thinking? Or maybe more importantly, who was the Fed really serving? Irrelevant of the answer, the tragedy here was public confidence was further weakened, uncertainty increased and the investment environment tarnished. The list is longer but it should be sufficient to ask and answer the most fundamental question - What do these shadowy financial shenigans all have in common? The answer should be clear. The US Federal Reserve and its Monetary Malpractice. Money always goes where it is treated well, is safe from confiscation, and is protected by enforced laws. When the laws are not enforced, are manipulated by influential powers or are not in the interest of society as a whole, money stops flowing and soon starts fleeing. The Federal Reserve's misguided policies and its failure to enforce its banking regulation role fostered and is responsible for the steady financial crisis we have witnessed since the S&L debacle of the early 1990's. According to David M. Sachs, a training and supervision analyst at the Psychoanalytic Center of Philadelphia, the crisis today is not one of confidence, but one of trust. The public, expecting to be protected from such abuse, has suffered a trauma of loss similar to that after 9/11. "People now feel more gratified saving money than spending it". In other words, just “looking forward” and promising to do things differently isn’t enough. "The legal system is supposed to be the codification of our norms and beliefs, things that we need to make our system work. If the legal system is seen as exploitative, then confidence in our whole system starts eroding. And that’s really the problem that’s going on." Is it fair to place the blame of the Crisis of Trust, stemming from one financial crisis after another, at the feet of the Federal Reserve? The answer is unquestionably, yes! The Fed's misguided policies and "selective" enforcement are the root cause. 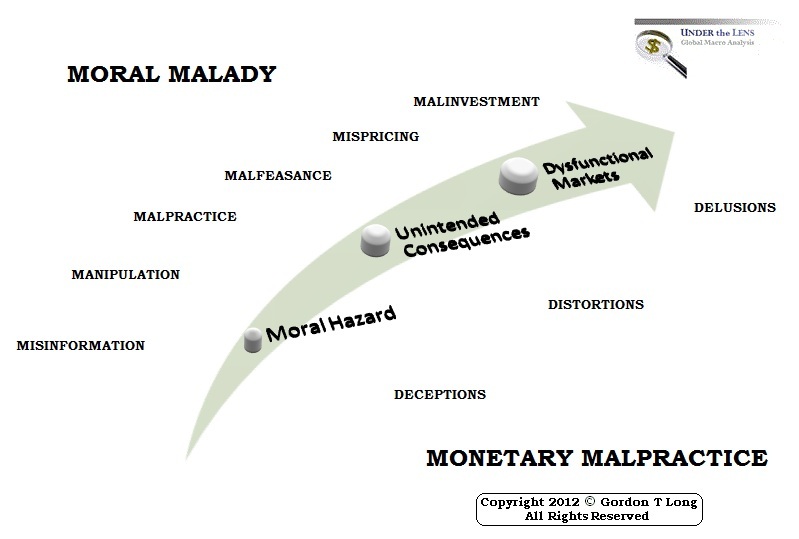 As I outlined in "MONETARY MALPRACTICE: Distortions, Decepitons and Delusions", it is most fundamentally a matter of how Moral Hazard and Unintended Consequences have led us to this. 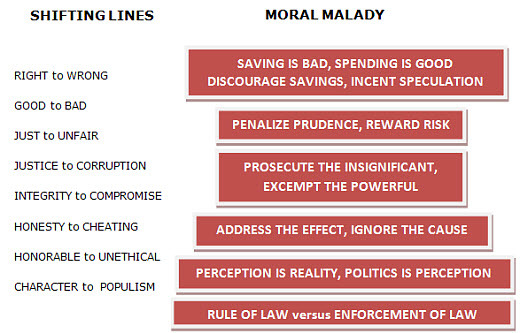 I will not revisit the list of Moral Hazards and Unintended Consequences (Video;Video; Report) but rather I want to focus on the Moral Malady that has "greeced the skids" and acted as a catalyst. LIBOR Scandal, MF Global, PFS etc. etc. Ever broadening and increasing llevels of non-performing loans. 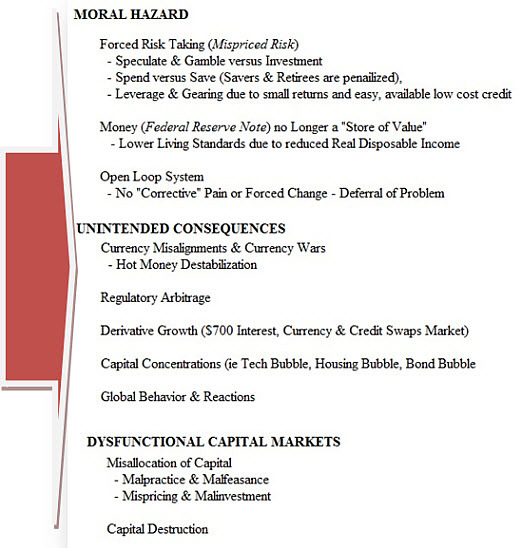 I have shown in "CURRENCY CARTEL: Counterfeiting Risk-Free", where in fact the whole idea of the US Dollar as the world's reserve currency is flawed and presently hiding enourmous levels of credit risk. 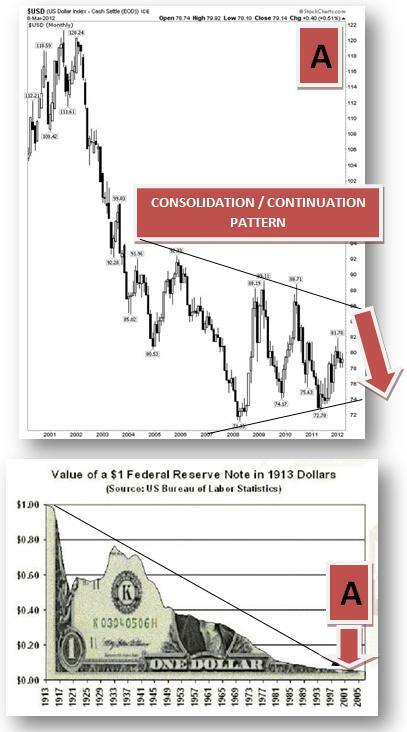 Let's review the Fed's policy of unsound money in the context of the US dollar. The loss of faith in the US dollar due to unsound money policies has steadily eroded its value since coming off the gold standard in 1971. As bad as this has been, it pales in comparison to what the Federal Reserve has achieved since the inception of the Federal Reserve in 1913. There has been a steady and from a long term view, almost complete collapse in the US dollar. This devaluation has effectively achieved a massive transfer of wealth from private individuals and small business, to expanding banking hands and the emerging financially funded conglomerates. Today the Crony Capitalist Conglomerates feeding at the public trough, to name only a few, range from the Military-Industrial Complex, which President Eisenhower specifically warned us about, to the Banking-Financial-Insurance (FIRE) Complex, to the rapidly expanding Security & Surveillance Complex. The deflective shell game the government plays to avoid direct responsibility for this blatant debasement of the currency is almost laughable if it wasn't so tragic to so many people. On the one hand, the Federal Reserve refuses to answer questions about the US dollar and defers all discussion regarding it to the US Treasury. In this game of badminton, the US Treasury in return refuses to answer any questions on interest rate policy and always defers them to the Federal Reserve. It isn't just the "split and divide" that avoids accountability but rather what it deflects. In actual fact the Federal Reserve is most directly controlling the US dollar through monetary expansion & debasement and the US Treasury, inflation due to out of control Fiscal Spending. The complete opposite of what is happening. Even if you take objection to my view, minimally this game should not be allowed for the sake of full disclosure, openness and accountability. This is just an example of how complicit the banking industry is with the government and visa versa. This is because the simple truth is that the primary role of the Federal Reserve is to ensure the government is funded. The primary function of politics is first and foremost the transfer and redistribution of wealth. By increasing the spending of the government and its funding requirement, the transfer of wealth is carried out through debasement of the currency and inflation. Inflation should be considered nothing more than another form of taxation. In this role the Federal Reserve has crushed interest rates to negative real rates across the entire yield curve to allow the government to fund its massive and unfundable debt. It has done this in concert with the other three dominate global fiat-based currencies. By executing this strategy it has allowed the four major global fiat currencies (£, €,¥ and $) to devalue, without allowing an escape hatch, unless you could invest "off world". The only real alternative is to invest in precious metals and real hard assets. The problem with this alternative, is that they may be a store of value and wealth, but they don't generate dividends and income which drive the valuations by which fund managers are incented and measured. The massive and unprecedented recent LIBOR Scandal is only the tip of the iceberg of news where banks and financial intermediators quietly settle and pay token fines compared to the profits reaped. To them it must seem to be just a business expense. Unless someone in the board room or executive suite actually goes to jail we should expect it to be nothing else. To the public it is more. It is their standard of living, their childrens education, their retirement, their entire ideal of the America dream. At one time the concept of fiduciary responsibility was paramount. Today it is something kept primarily to the propectus and other marketing materials. The false belief that enslaves us is that the Federal Reserve through its dual mandate has the best interests of Americans at heart. It doesn't. It has the best interests of America at heart and there is a major and growing difference. It was once said that "What is good for General Motors, is good for America". At one time that may have been true. It no longer is. We are chained to ideas that are no longer valid, if they ever were. FALSE IDEAS and MISTAKEN BELIEFS. America has always been "the beacon on the hill" to guide the world. This is because it was perceived as a country where the "Rule of Law" was primary, and where the moral fabric of its people enshrined those beliefs in its Constitution, Bill of Rights and value systems. Money and Ideas were safe in America. YOU HAVE A CRISIS OF TRUST!